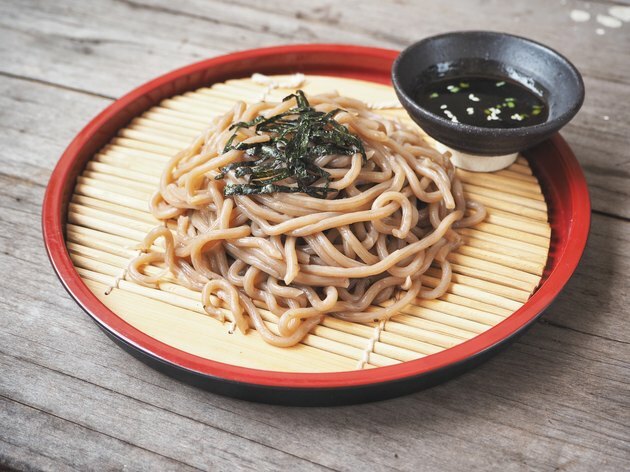 Soba noodles are Japanese noodles that are made from buckwheat flour. The thickness of the noodles is easily comparable to that of spaghetti, and they can be served both hot or cold. Their nutty flavor works well as a base for stir-fries and salads. While soba noodles offer beneficial manganese and fit into calorie-conscious diets, they also have some nutritional drawbacks. Buckwheat flour — the base for soba noodles — has many health benefits, as illustrated in many studies shared by the Oldways Whole Grains Council. As a gluten-free grain, it’s an alternative for those unable to consume wheat. Rich and Dr. Schapiro explain that buckwheat flour is a good source of nutrients like protein, fiber, iron, carbohydrates and thiamine. Buckwheat noodles are also a great source of manganese. A cup of cooked noodles boasts 426 micrograms, which contributes 19 percent toward the daily manganese needs for men and 24 percent for women. Manganese makes up a component of several enzymes, including those needed to convert food into energy and antioxidant enzymes — a class of enzymes that quash harmful free radicals to prevent cell damage. Manganese also helps make collagen, a protein required for wound healing, and maintains healthy cartilage and bone. Buckwheat noodles don't offer a significant amount of any essential vitamin, however, and aside from their manganese content, don't supply much in the way of minerals. “Some say one-hundred percent buckwheat flour can be as healthy as eating fruits and vegetables,” say Rich and Dr. Schapiro. “This doesn’t mean you should only consume a diet of buckwheat flour and not to eat fruits and veggies.” Learning how to integrate it into your current diet is key to maintain well-rounded nutrition. Soba noodles offer a lower-cal alternative to wheat pasta. Each cup of cooked noodles contains only 113 calories, or just over five percent of the daily limit in a 2,000-calorie diet. White spaghetti, on the other hand, contains 220 calories per cup, while a whole-wheat version contains 174 calories. If you eat pasta three times per week, switching from white pasta to soba noodles will save you over 16,692 calories annually, or the equivalent of almost five pounds. Soba noodles impact your blood sugar levels because of their glycemic load. A food's glycemic load takes into account its carbohydrate content as well as how quickly the food increases your blood sugar level after you eat it. Soba noodles have a high glycemic load of 22, which means they can have a significant effect on your blood sugar levels. The Harvard School of Public Health recommends limiting foods with a high glycemic load, and instead opting for lower-GL foods like beans and whole grains, including whole-grain pasta. If you switch from wheat pasta to soba noodles, you'll miss out on the B-complex vitamins, iron and selenium found in wheat pasta. Pair other ingredients with your buckwheat noodles to prepare meals rich in nutritional value. Top your noodles with chicken breast, shrimp, tofu or tempeh, and add steamed or sauteed vegetables as sources of fiber, vitamin C and antioxidants. Read more: Should You Be Paying Attention to the Glycemic Index? Is Spaghetti Good for Weight Loss?